According to Executive Director Tami Forman, Path Forward plays a critical role in helping hiring managers overcome internal biases that may negatively impact their impression of someone looking to return to the workplace following an extended, caregiving-related absence. When San Mateo-based software company Medallia first partnered with Path Forward, HR immediately recognized the need to erase the stigma attached to returners. They set out to educate hiring managers and challenge their expectations when it comes to people who have spent a number of years out of the workforce. On the employee side, Path Forward helps returners—mostly women—recognize the value of the skills and experiences they acquired while not working in a traditional sense. Whether they were volunteering at their children’s schools or coordinating a community effort, Forman says, women often short-sell themselves when seeking reentry to the workplace. 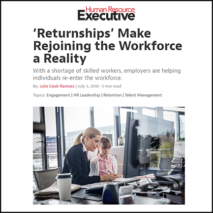 Read the full Human Resource Executive article by clicking here.